We were established in 1950 by a group of local business men to serve the children of Springfield. Monies raised by Kiwanis Club of Ozark Empire are used to; purchase new shoes for distribution through the Springfield Free Shoe Bank program, fund youth education and organized activities, and assist established organizations in fulfilling children's needs. Kiwanis Club of Ozark Empire is a community service organization, chartered in 1950 under the auspices of Kiwanis Club International USA, and supports the service to and support of, children's projects throughout the world. The story goes that, back in the 1950s, several Springfield business leaders formed a second Kiwanis Club in order to supply kids in need with brand-new shoes. “We’ve given out 25,000 pairs of shoes over the years,” said Jim Weld, treasurer for the Kiwanis Clubs of Ozark Empire. The Price Cutter Charity Championship presented by Dr Pepper, a major fundraiser for Ozarks children’s charities, is proud to have the Kiwanis Clubs of Springfield on board for the first time. 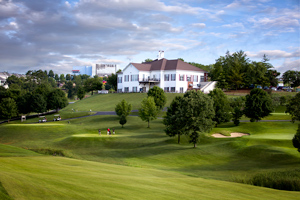 The tournament has gifted almost $13 million in its 26-year history, with the tournament long given national appeal because it is part of the PGA’s Web.com Tour. A year ago the Kiwanis Club of Ozark Empire handed out more than 1,000 pairs of new shoes at the Shoe Bank. 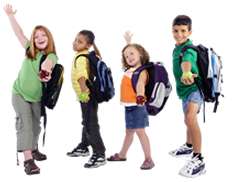 For a child to receive a new pair of shoes, they must qualified for the federal free or reduced food programs in public schools. The Kiwanis Club’s shoe bank is open on Thursdays and some Saturdays during the school year. 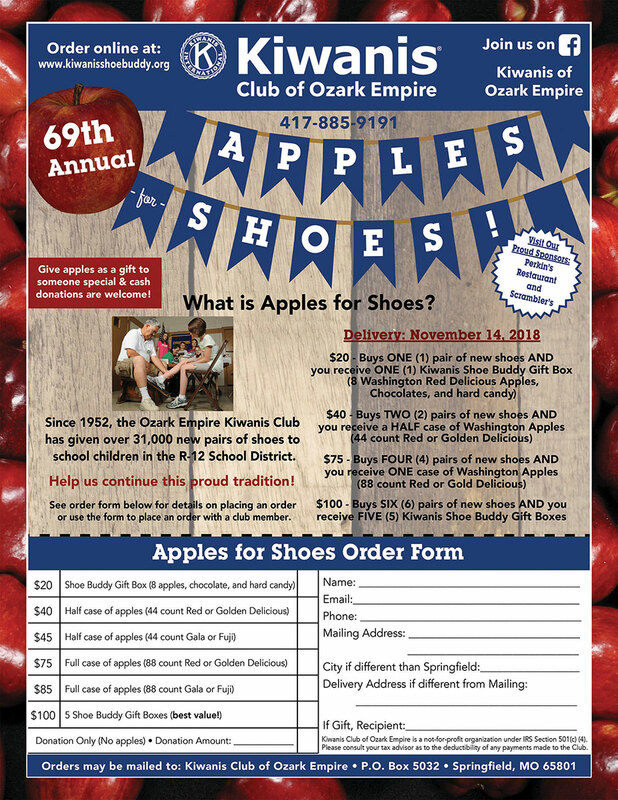 Download the 2018 Apples for Shoes Order Form Today! Choose an event to help Kiwanis Ozark Empire help our youth. Our club has been hand fitting new shoes to Springfield children in need for over 60 years. Please show your support by a donation today. A $15 donation will buy 1 pair of new school shoes for a Springfield school child. Kiwanis Club of Ozark Empire was chartered in 1950. 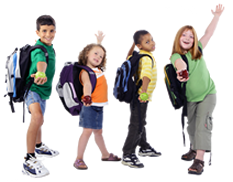 Through coordination with the Springfield School System, the club’s founders chose the mission of providing financially qualified Springfield school children with brand new, free school shoes. The club’s mission to build children’s dignity through new school shoes has continued uninterrupted for over 63 years, making it one of the longest running community service projects in the State of Missouri. The club raises all monies, buys and stocks different styles of new shoes, and even operates a city-wide, free shoe bank in collaboration with the Springfield PTA’s Clothing Bank. To this day, members of the Kiwanis Club of Ozark Empire and its friends still spend one-on-one time personally hand fitting shoes for pre-qualified school children, grades K thru 12. Each child even gets to express their individual “style” by picking out their own shoes from the shoe bank’s varied stock of new shoes. During this last school year, the Kiwanis Shoe Bank hand-fitted over 1,100 pairs of new shoes. That brings the total number of new shoes purchased, hand-fitted and given to Springfield school children since 1950, to over 26,000 pairs of free shoes. In 1950 club members realized that a club grows and is successful only if it is fulfilling a community need and has the funds available to meet those needs. Charter member Omer North (now deceased) presented to the Board of Directors a plan to raise money. That plan was to sell apples on the streets of Springfield to earn funds to buy shoes for the needy children in the city. The plan was unanimously approved. In the beginning members focused on selling apples to individuals in the business district and selling from house-to-house. The plan would require a large number of people; on recommendation of another club member, the club enlisted the help of students from Central Bible College. As time went by, Kiwanians began selling boxes of apples to firms and individuals throughout the city, and at the same time the street sale of the students continued to grow. Later in the 1950's, Evangel College students and Drury College Sororities also participated. In the 50's and 60's successful sales provided money for the club to use in worthwhile projects. In the 1970's the student street sales were discontinued due to increasing automobile traffic and concern for the safety of the students. 2010 marked the 60th year of this very successful fundraiser and the introduction of the new Shoe Buddy program. The Shoe Buddy program was started as a way for someone who did not need a full or half case of apples to participate in the annual apple sale fundraiser. 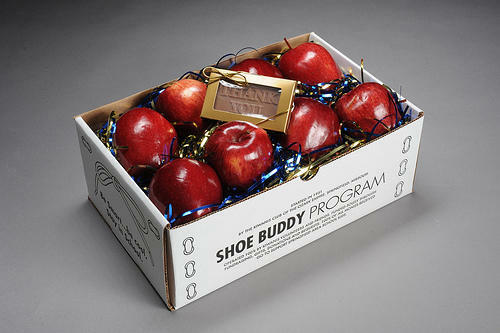 For a $25 donation the club provides the donor with one of their newly developed Shoe Buddy shoe boxes filled with eight apples and a chocolate bar. The new shoe box was designed by club members as a replacement for the damaged or missing shoe boxes in their shoe bank. This year smaller Shoe Buddy boxes with special backers have been provided to apple sales customers as donation boxes to be placed in their community. Using the new shoe boxes as part of the fundraiser has provided the club a great way to increase awareness of their shoe bank. To kick off the first year of the Shoe Buddy program the club assembled 150 Shoe Buddy boxes and distributed them throughout the community. Several local media outlets have already taken notice of the program and have helped the club promote their annual apple sale. Many club members take a day off from their jobs to sell apples and to voluntarily deliver the apples using their own vehicles. The proceeds of the fundraiser are used to purchase new shoes for needy children in the Springfield School District. In addition to buying the shoes, several club members volunteer their time each Wednesday at the SPS Shoe Bank, fitting the children who are referred by their school. Be a Supporter. Complete this form and mail in today. Special signage at hole designated for a valuable prize. Cash Prizes awarded in two flights! Come join us for the fun and support a good cause at one of the nation's premier Golf Clubs! 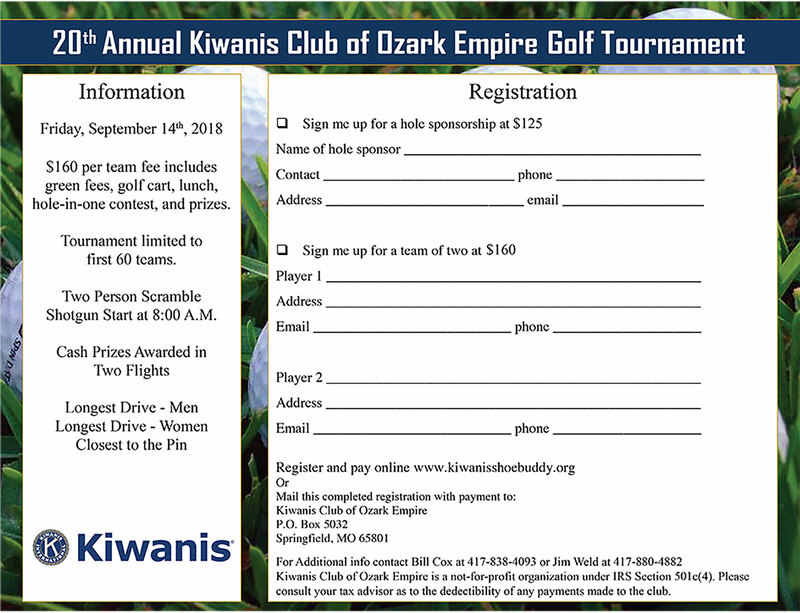 The Kiwanis Ozark Empire Club is holding a golf tournament at Rivercut Golf Course. This tournament is open to all. Your $160 (team of two) registration will include lunch, 18-holes with cart and prizes. The deadline for registration is Thursday, September 13th. At the Kiwanis International Foundation, our mission is to assist Kiwanis International in serving the children of the world. After all, that service makes up Kiwanis’ own mission. So the work of our foundation helps the Kiwanis family of programs change children’s lives—often in ways that would otherwise remain beyond the resources of clubs and districts. Stewardship. We are committed to meeting and sustaining donors’ confidence that our foundation will invest their contributions wisely and distribute them in keeping with the values inherent in the Kiwanis International mission. Responsiveness. We are relevant and proactive in meeting donors’ and grantees’ needs. Legacy. We give donors the opportunity to leave a lasting mark on the world. Integrity. We deal honestly in our interactions with all stakeholders. Trust. Through the integrity of our actions, we seek to earn and maintain the trust of our Kiwanis family and constituents. Along with all these values comes accountability. Your gifts reflect your hope for children’s lives—and your trust in us. So we strive to earn that trust. We share records and reports that document gifts, grants and the people we serve.